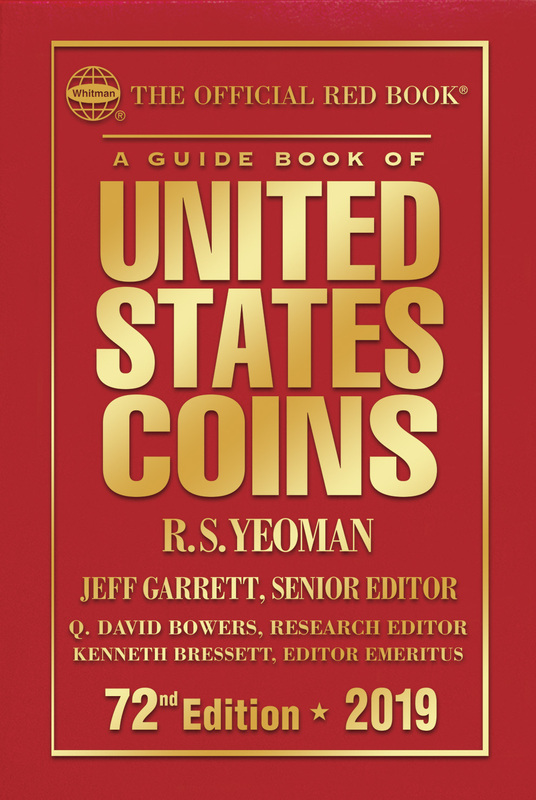 (Pelham, AL) — The 72nd edition of the hobby’s Guide Book of United States Coins (popularly known as the “Red Book”) will debut at the Whitman Baltimore Coin and Collectibles Expo on March 22, 2018. It features new and extensively updated content reflecting the current market for collectible coins. The Red Book can be pre-ordered online (including at Whitman.com) in several formats. After the Baltimore Expo it will be available from booksellers and hobby shops nationwide. Research Editor Q. David Bowers said, “The Red Book is a single-volume library. It gives collectors and dealers valuable historical information for every U.S. coin series, from half cents up through gold $20 coins, and more.” These are illustrated by 2,000 photographs, including more enlarged close-ups of rare die varieties this year. The latest coins from the United States Mint—Lincoln cents, Jefferson nickels, Roosevelt dimes, America the Beautiful quarters, Kennedy half dollars, Native American dollars, commemorative coins, and government-packaged coin sets—are kept up to date. The 72nd-edition Red Book includes illustrations of the Mint’s new 2018 Centennial of World War I silver medals honoring the U.S. Army, Navy, Marines, Air Service, and Coast Guard, plus the World War I silver dollar and the new program of Breast Cancer Awareness commemoratives, including, struck for the first time ever, a pink gold $5 coin. The 72nd edition covers 71 additional new issues compared to the 71st edition, and 15 new coin sets. Mintages have been updated across the board using the latest numismatic research and government data. The 72nd edition continues a section that debuted with the 70th, covering foreign coins that circulated as legal tender in the British American colonies and early United States. This section includes photographs, history, and pricing for collectible Spanish-American, Dutch, French, and English coins dating from the 1550s to the 1820s. Expansions and updates are also seen in the appendices. The appendix on modern U.S. Mint medals covers more than 40 medals and sets, now including the American Revolution Bicentennial medals, National Wildlife Refuge System centennial medals, silver Presidential medals, and others. As in past years, collectors will benefit from the Red Book’s recent auction records provided for significant rare coins. Listed throughout the charts are nearly 200 notable auction results. Combined with the listed retail prices, the auction data help advanced collectors understand the modern market for high-priced rarities. In addition, the appendix of the “Top 250 U.S. Coin Prices Realized at Auction” has been fully updated. Since the last edition 2 more coins have broken the $1 million mark, for a new total of 95. The coin at #250, a 1794 silver dollar, sold for $4,200 more than #250 in last year’s edition. In a positive measure of the health of the hobby and ongoing numismatic research, the Red Book’s bibliography includes 28 standard references published within the past five years. The cover of the spiral-bound 72nd edition shows a mix of classic and modern American coins: a 1792 Birch cent, a 2017 Boys Town commemorative silver dollar, and an 1855-S Liberty Seated half dollar. All versions and formats of the 72nd-edition Red Book will be available at its national debut at the Whitman Publishing booth during the Baltimore Expo, March 22–25, 2018, at the Baltimore Convention Center. The 72nd edition of the Red Book is available online and at bookstores and hobby shops nationwide. In addition to offering a Large Print Edition and several formats of the regular edition (hardcover; spiralbound softcover; and spiralbound hardcover), Whitman Publishing is also taking pre-orders for the leather-bound Limited Edition (250 copies autographed by Bressett). Details about the forthcoming 1,504-page expanded Deluxe Edition, popularly known as MEGA RED™, will be available at the Whitman Baltimore Expo and pre-orders will be taken for anticipated delivery in June. For more information and to order, visit Whitman Publishing at www.Whitman.com. Whitman Publishing is the Official Supplier of the American Numismatic Association. As a benefit of membership in the ANA, members can borrow the Red Book (and other Whitman books) for free from the Association’s Dwight N. Manley Numismatic Library, and also receive 10% off all Whitman purchases. Details are at www.money.org.